Titleist Performance Institute’s (TPI) movement analysis system to examine the Golf Body-Swing connection. TPI practitioners use this advanced screen to help determine how your limitations are preventing you from performing an efficient, powerful swing. TPI is the leading brand in golf instruction and works with many of the world’s top golfers including Jordan Speith, Adam Scott and Jason Day. 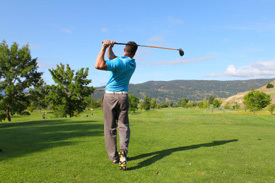 At Spine and Sports Injury Center, we use the TPI screen in conjunction with an advanced physical therapy evaluation to assess and treat common injuries or deficiencies that occur in the golf swing and enhance power and consistency.